It’s always good idea to give yourself some extra time when heading somewhere. And if you know that it’s around the time kids are arriving at school or school is letting out, this is a must. Knowing where schools are is important too. You can take a detour on a different road if you plan ahead. It’s not always possible, but when it is it can be helpful. 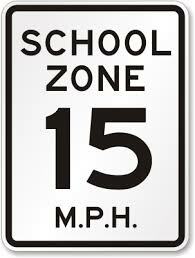 If you do find yourself in a school zone, please, make sure you obey the traffic rules. Slowing down to 15mph when lights are flashing can save a life. However, it’s a good idea to always be extra cautious in these areas, not just when the lights are flashing. And put that cell phone down! The risk is just not worth it. This entry was posted on Saturday, September 6th, 2014 at 7:10 am	and is filed under Community News, Random Thoughts. You can follow any responses to this entry through the RSS 2.0 feed. Both comments and pings are currently closed.